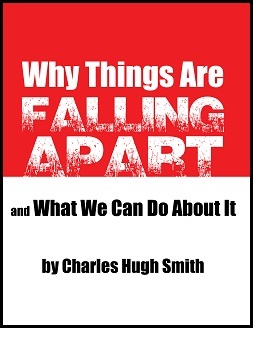 charles hugh smith-Have We Reached Peak Government? 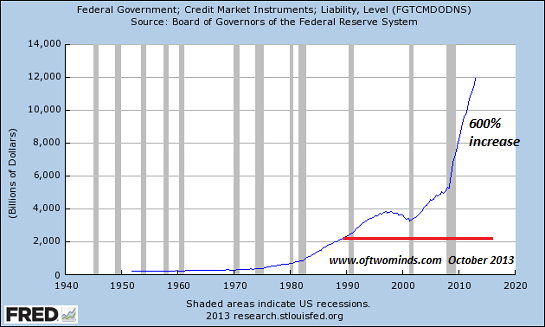 If we are not yet at Peak Debt, we are getting close, and that means we are also getting close to Peak Government. Have we reached Peak Government? That is, a structural point beyond which government can no longer grow sustainably? In other words, if growth depended entirely on population growth, the real (inflation-adjusted) economy would have grown 28% since 1990. Instead, the GDP rose by 75%. 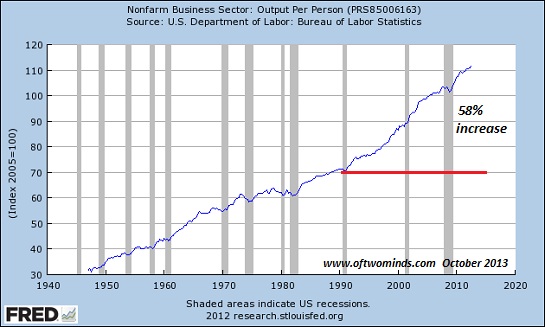 This is the result of rising output per person, i.e. an increase in productivity. Since the state (government) depends on the economy to generate its tax revenues, government cannot grow sustainably at a rate that exceeds the expansion of the economy. 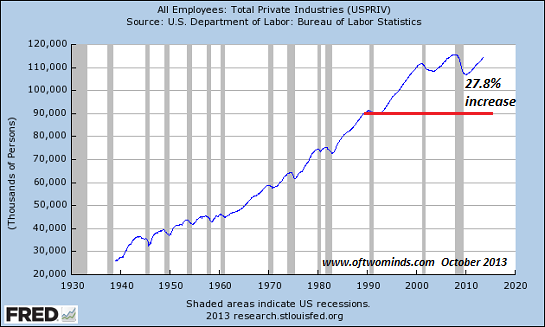 Thus we expect government to grow at around the same rate as the economy and productivity, i.e. around 60% to 75%. 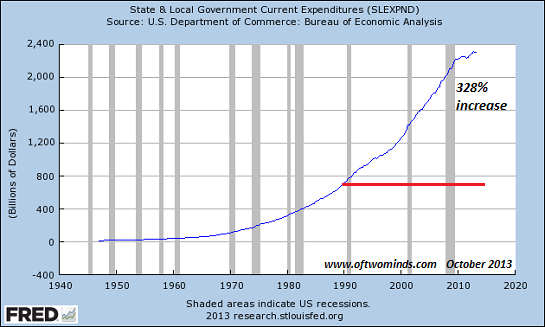 But Federal government expenditures have risen by 317% and state/local government spending has leaped by 328% since 1990. 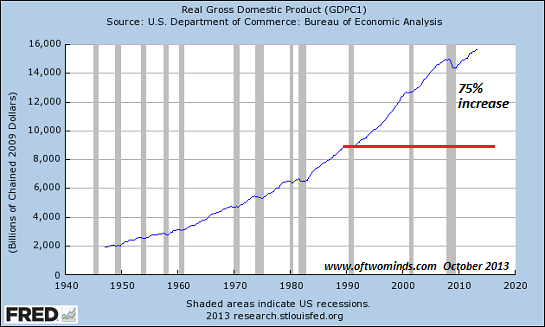 In other words, government has expanded at roughly four or five times the underlying growth rate of the economy. 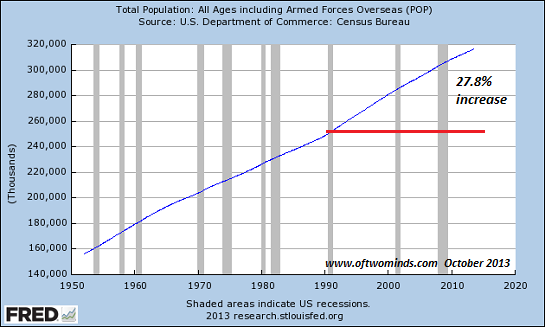 How can government expand 300+% while the underlying economy that supports it expanded by 75%? Answer: borrowing money, i.e. 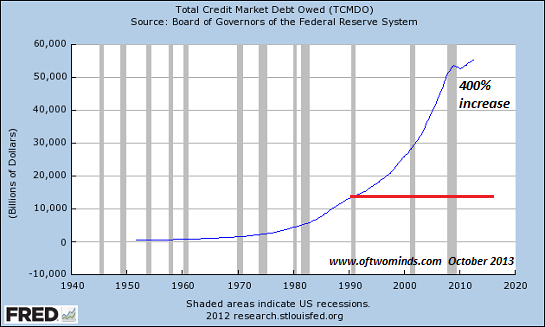 debt--lots of it. 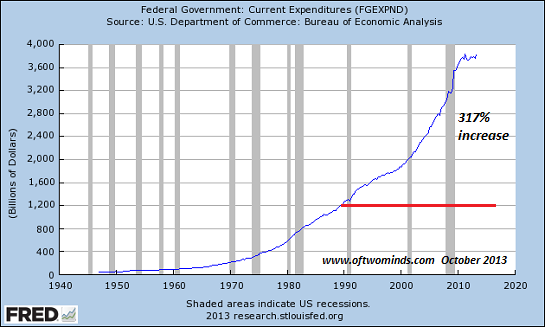 Federal debt has skyrocketed by 600% since 1990. So the question of Peak Government is ultimately a question of Peak Debt: how much money can the government borrow to sustain its current spending? 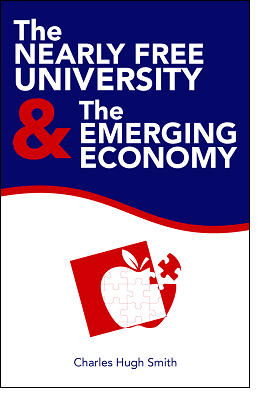 Can public and private debt expand at rates four or five times that of the underlying economy? If so, for how long? 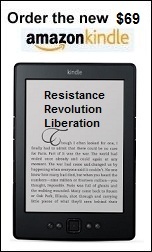 Thank you, Andrew H. ($5/month), for your exceptionally generous subscription to this site-- I am greatly honored by your support and readership.